After hearing all the hype about this breakfast / brunch place in Nashville, our family finally decided to try it out and hoped for the best. And when I say 'hope for the best', I not only mean praying for impressive food but also to be spared a long wait which, we also read, is not unusual for this place. Thankfully, it was a weekday and we had also heard of a second, less-crowded location in Hillsboro Village. I'm referring to Biscuit Love, a Nashville restaurant that has its roots from a food truck business, and which has quickly become a destination place for both locals and tourists. They boast of made-from-scratch creative takes on some popular breakfast and lunch dishes, and of course, as their name implies, biscuits you can fall in love with. 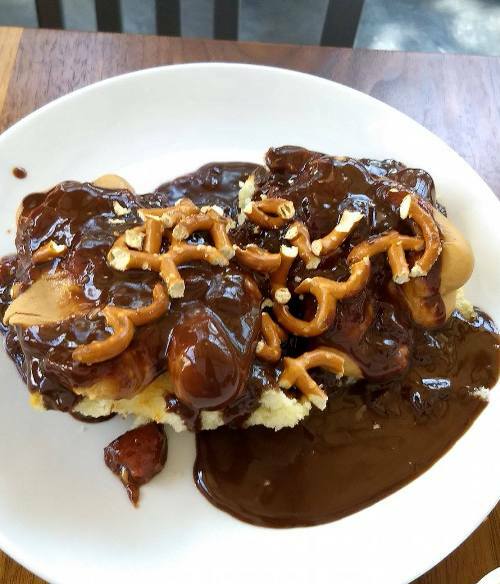 The Gertie -- biscuits with chocolate sauce, HUGE dollops of peanut butter, caramelized banana jam and pretzel bits. For our drinks, my husband had hot coffee, I ordered iced coffee, and my son had sweet tea. For this particular Biscuit Love visit, I went in expecting an 'OMG Yes' but walked out with a 'half Meh-half Good'. Service was good. The staff was friendly, knowledgeable and efficient. When you enter this restaurant, you are handed the menu right by the door and you place your order and pay even before you are seated. We visited on a Wednesday morning, arrived at 11 a.m. and the place was wide open. That was a very pleasant surprise. I would agree with every single comment and write-up out there that the Bonuts were good. I'd say that was the highlight of our meal. But even then, my husband found it too greasy. I argued that all donuts are greasy since they're fried. He didn't buy it. He just didn't particularly enjoy the oily feeling when he bit into them. I didn't mind it. 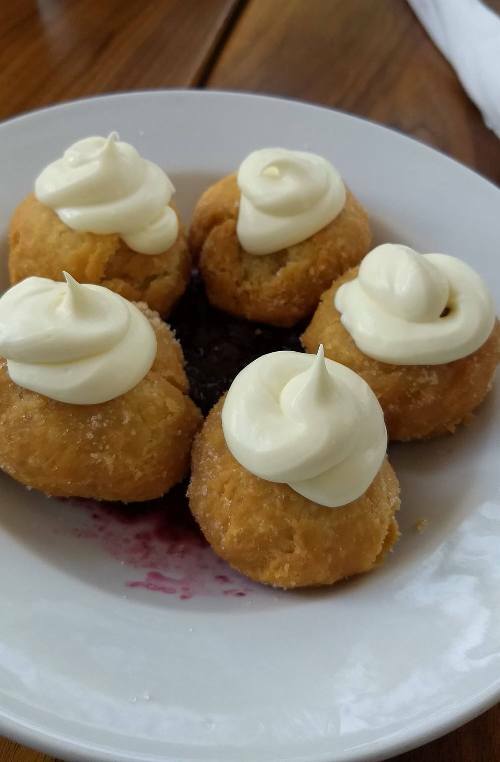 I enjoyed the mascarpone and blueberry combination in each bite, but again, I wouldn't say it was mind blowing, nor life-changing. I've had dishes before where it was 'OMG, I just forgot my name' with one bite, but this wasn't like that. Now let's talk about the Gertie. On paper, this is amazing. Who wouldn't love chocolate and peanut butter?? I was really excited about this and it was actually my son's idea to order this. After several bites though, we all quickly realized that we didn't like the execution of this dish. The peanut butter component was just too much. You put this in your mouth and you wouldn't be able to speak, nor taste anything else, other than the gummy peanut butter. If they had toned down a bit on the peanut butter, this might have worked. The other thing that didn't work for us was the fact that the biscuits were not strong enough vessels to accommodate the other sweet components. They just crumbled on the plate every time we would cut into them. I'm not sure if some people like that sort of biscuit texture, but we were not fans of it. The picture below shows you the aftermath. And as you can see, there's just way too much peanut butter, even for a peanut butter lover like me. When I ordered the Gertie, the server informed us that this was a creation of the owner's child. A+ for playfulness, but there was much to be desired in terms of finesse and restraint in this dish. 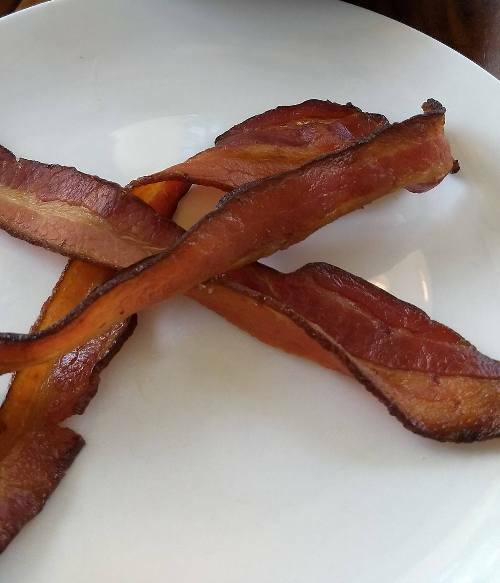 I ate the Gertie with a side of their Chronic Bacon. Again, this one was better on paper. It said sweet and spicy, but it just tasted like regular thick bacon for me. I also realized that I'm more of a thin, crispy gal than a thick cut one. (In case you're confused, I'm clearly not referring to my body type). 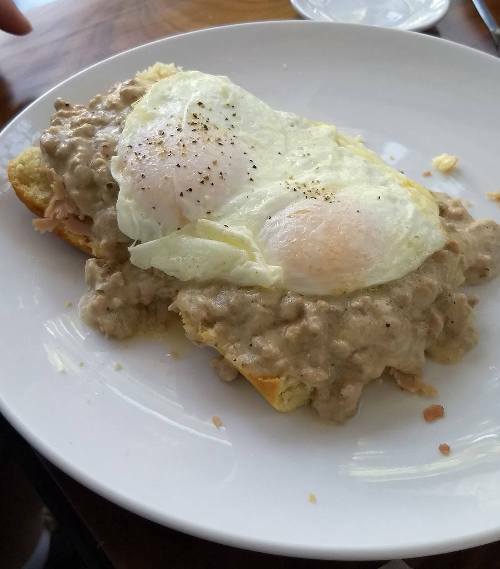 My husband had the Southern Benny. Again, he wasn't impressed with the flavors. There was nothing disgusting about it, the flavors were okay. But again, it just had to do with what he expected vs. what he got. He said he's used to biscuits being flaky, not cakey or fluffy. I'm not sure if Biscuit Love does both, but for all the dishes we ordered, the biscuits were fluffy. Some people say REAL biscuits are meant to be fluffy and crumbly. Others say they should be flaky. It doesn't matter to me, as long as I see that the texture goes well with the intention of the dish or how you're supposed to consume it. I prefer my bread to be a strong enough element in my dish such that it doesn't just crumble on my plate and be swallowed by all the sauce. 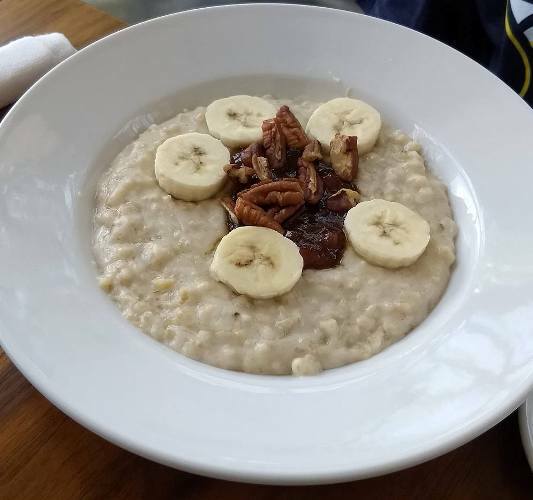 Finally, the Bananas Foster Oatmeal. My son and husband both said they found it too sweet. I disagreed with them. But could it be because I moved from the Gertie to the oatmeal? Maybe. But sweetness aside, I thought this was one dish that was very well executed! The creaminess was spot on and I think that's an achievement. Oatmeal can easily turn gloopy but this wasn't anything like that. This one exceeded my expectations. 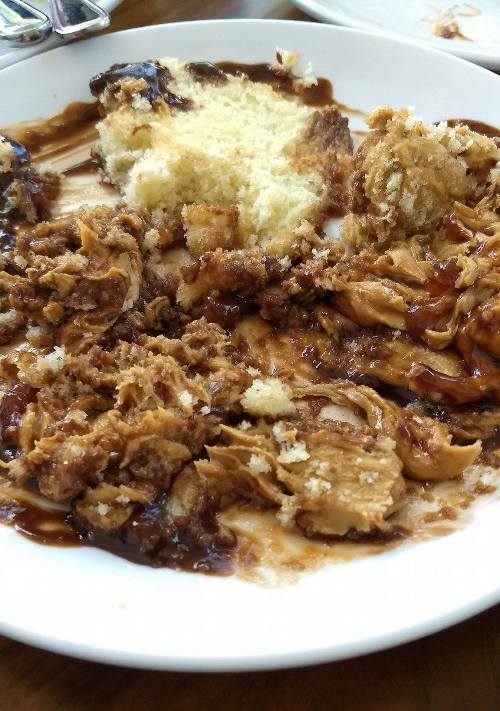 In sum, Biscuit Love isn't bad at all, but we didn't think it was ahhmazing either. This place didn't wow us and we were left wondering about all the hype. Maybe we didn't order the right things from the menu? Yes, I've considered that possibility. But then again, I walked in there thinking that after all the raving reviews, I couldn't go wrong with any dish off of their menu. Clearly, that wasn't the case. For the price we paid just for breakfast food, we wish we stepped out impressed and not just half Meh-half Good. All food reviews depend on the reviewer's preferences and expectations. I'd even say there are so many extraneous variables that can affect one's assessment like mood, weather, parking situation, etc. That said, all I can say is that my husband gave it a Meh and I gave it a Good. Would we go back?...Let's just say I'm more forgiving than my husband. Have you been here? Share your thoughts!